It's high time I prepared anything with Tapioca (Maravalli Kezhangu). I bought frozen tapioca from Indian store this weekend. 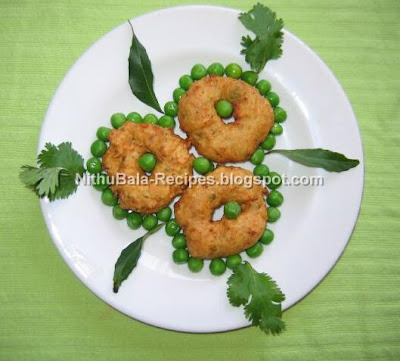 I used to make Tapioca vada but never tried with peas. Just for variation in taste, I added peas. The Vada looked too good with slight greenish tinge with the usual golden brown colour. Inside it was green. My hubby and I enjoyed it with a cup of tea. With the same batter, with the addition of few ingredients, I made Bonda too. That too turned out to be good. 1. Soak Urid dhal for 2 hours. 2. Cook peas and keep aside. 4. Grind dhal and peas separately. 5. Now, mix ground dhal, peas and grated tapioca. 6. Add salt, coriander and curry leaf to the batter. 7. Heat oil and make crispy vadas. 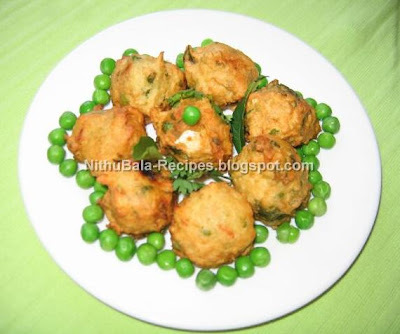 I just added 1 tsp pepper, 1/2 tsp jeera and 1/4 cup grated coconut to the same vada batter and made them in to bonda. Very unusual but mouthwatering combo, dear. Love the way you have presented it! Hi, This is my first time here. This dish is new to me. I will come back and check out what you are cooking the next time. Never Prepared this before. Thanks for the nice recipe Nithu. Interesting combo, loved the presentation. Perfect and beautiful presentation..Tapioca - peas comb sounds yummy and great. very good presentation esp the first pic is awesome and what a unique one..looks very yum..
What an amazing treat!! Yumm.. Both bonda and vada looks fantastic, crispy and prefect evening snacks to enjoy! Came to know you from Rohini's blog (curriesandspices). You have a beautiful blog here. Never tried this,vada with tapioca,but sure wud have been crispy and soft inside!